Forgotten since the emergence of Jordan Howard, Jeremy Langford and Ka’Deem Carey could be battling for an important roster spot. As great as Jordan Howard was last year, he had to leave a number of games with various bumps and bruises. He also missed a lot of time in his one season at Indiana. Neither of these things are surprising when you consider his violent running style. The Bears need a backup who can fill in for a series. They need a backup who can fill in for a game. I’m not sure they have one who can do both. That’s where this dilemma begins. If it is simply about picking the best all around running back, Langford would be the pick. He has dangerous speed, makes plays in the passing game and has regularly shown the ability to make gains in short-yardage situations. But Langford is a bit of a boom-or-bust runner and he’s had tough time simply moving the chains. While his rookie season was largely viewed as a success, Langford averaged just 2.7 yards per carry in the first quarter and 3.5 in his first 10 attempts of the game. He improved the more he touched the ball, with a 4.0 clip on attempts 11-20. Carey has been the opposite of Langford. In 2014 he averaged 4.5 yards per carry in his first 10 carries. Two years ago he was at 4.0. Last year he finished at 3.9. While he doesn’t have speed, he has a good burst and runs with power. If the Bears want someone to spell Howard, Carey seems to be a better fit. But he’s never shown he can handle a starting load, having never touched the ball more than 14 times in a game. He also doesn’t add much to the team as a receiver and his lack of speed limits the plays the team can run with him. In an ideal world, the Bears would keep both and John Fox has been known to keep four running backs. But the Bears kept three last year and there might not be room for more. The Bears kept just two quarterbacks and three tight ends last year, both of those numbers could increase this year. It would be a major shock if they didn’t keep three quarterbacks. It’s hard to see them keeping fewer than six wide receivers or eight offensive linemen. 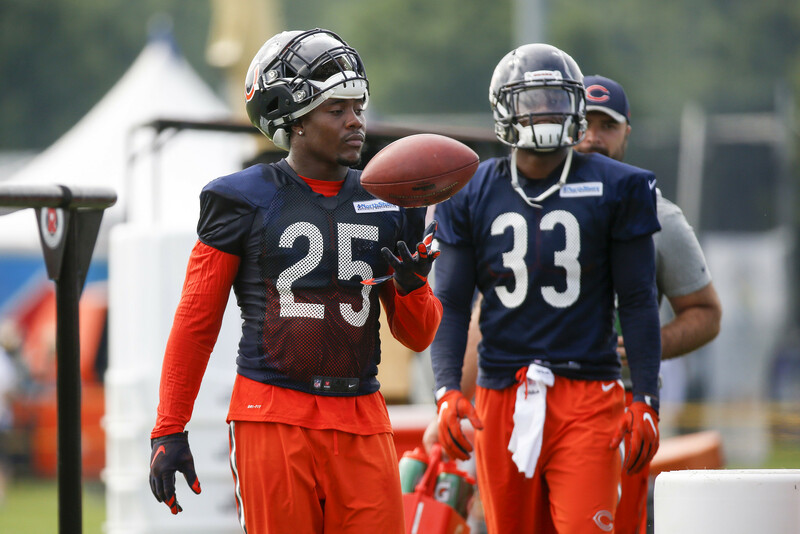 As the Bears prepare for camp, both Langford and Carey are on the bubble. Those spots usually come down to special teams, but, in this case, the player is also the primary backup running back because Tarik Cohen is a specialty player. Cohen will have a significant role in this offense but the Bears don’t envision him EVER carrying the ball 20 times on a Sunday. Perhaps the ability to catch passes out of the backfield would make Langford a capable fill-in for Cohen as well, therefore giving him the edge over Carey. But Carey is just a much more natural ball carrier with better vision and tackle-breaking ability. If all goes well, the backup job won’t end up being that important. Howard took over 66 percent of the team’s carries last year and, ideally, he’ll have even more in 2017. But Howard does have a history of injuries and, let’s be honest, things tend not to go well when it comes to the Bears, especially when it comes to injuries (knock on wood). The player Fox chooses to back up Howard could end up being important. He chose wrong last year, keeping both over Jacquizz Rodgers. Strong arguments could be made for keeping both players, which is why it will be interesting to see them compete in training camp.